Tampa, Florida is located in Hillsborough County and home to over 350,000 residents. We are home to the Tampa Bay Buccaneers and to USF. Tampa is known for it’s amazing weather, lush landscapes and million dollar homes. Forty nine percent of homes in Tampa are owner-occupied. If you own a home in Tampa or even rent a property you know that nourishing and maintaining your landscape is a must. 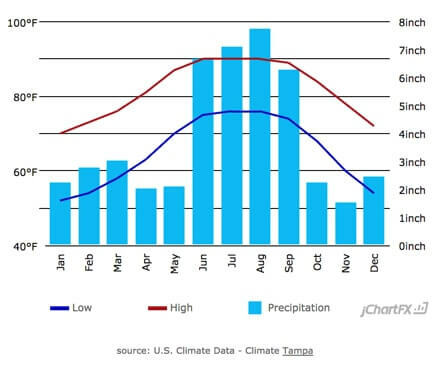 Tampa gets a whopping 43 inches of rainfall each year. This means that it’s important to monitor your lawn’s moisture and irrigation. Believe it or not, there are even times when Tampa is short on water. During these times, Tampa’s water use restrictions come in handy. Since temperatures can reach 90 degrees in the summer and drop to 30 degrees on winter nights, it’s very important to take the proper precautions in caring for your lawn. 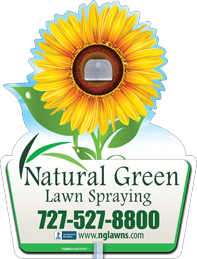 The average price paid for a fertilizing service in Tampa is $104/mo. This does not include treating for insects, lawn diseases or weed prevention. Natural Green includes all four of these services in our monthly lawn plan but we make sure your lawn is still safe for kids and pets. 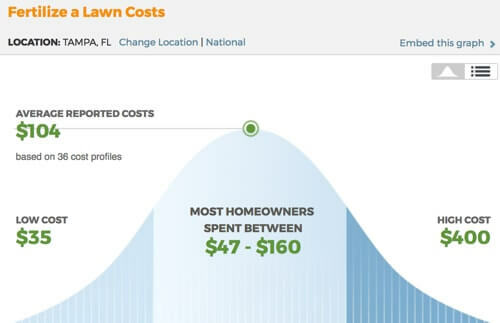 Pricing depends on many factors so why not set up a free lawn analysis with us today?